New in Fresh-Shopping Organizer - Search your 'Out of Stock' list! Version 2.2 out this month adds a multi-word 'search-as-you-type' feature to the Out of Stock list. What this means is that if you begin a search with say the letter 't' it will initially return all items in your list that contain words beginning with T or t (many Android apps simply have a 'string' search where all items that contain a letter 't' anywhere in a word would be returned) as you type the next letter, say 'e' it will return results containing words such as Tesco, tea, tempura, teabags, tenders, tequila, teriyaki, Tetley etc. 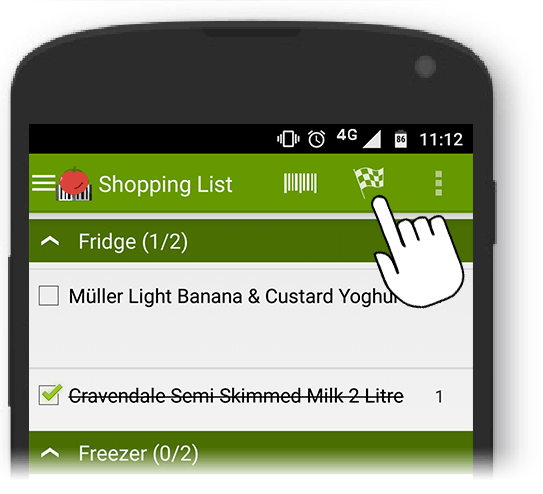 To narrow your search quickly Fresh allows you to add more than one word, for example if you were trying to add Tesco Milk to your shopping list you might just need to type 'te mil' to quickly find it, even if your list has over a thousand items! The words can be in any order, for example 'milk tesco' will find all your items containing those two words in any part of the item description. Note: You never have to manually add items to the Out of Stock List, they are automatically added each time you 'bin' or delete an item from any Stock List. Many more features are planned for the coming months! Fresh Shopping Organizer was launched one year ago in June 2015! Our original aim was to provide an efficient way to keep track of what you have in your Fridge, Freezer and Pantry by avoiding having to type anything; when you scan the barcode it automatically puts the item in the usual storage location with a suggested expiry date and a full description. We also included a very basic shopping list. Of course we included the ability to be able to change the expiry date on the stock lists, the quantities on the shopping list, and the ability to move things between the lists, but until now you haven't been able to change the product descriptions; in part this was deliberate because if you're sharing your lists with other family members or friends, you can run into problems if someone edits "BelGioioso Mascarpone Cheese 8 oz" needed for a cheesecake recipe, to "Cheese 8 oz" and you end up buying cheddar cheese, nobody is going to like your cheesecake! Manufacturers are supposed to ensure that a barcode is unique to a particular product, but over time they often tweak the ingredients or change the name - remember those Innocent super smoothie "Defense" drinks? The same bar-coded product is now called "Re[Charge]"! Although we update our database on a regular basis we know that sometimes you want to edit the description yourself. So the latest 2.1 version released this month let's you edit product descriptions in the Stock Lists and Shopping List... just be careful! We know that sometimes barcodes don't scan or mis-scan for many reasons, and although we provide a way for you to do a barcode look-up on our website where you can scan a 'clean' barcode, we know this isn't always convenient. So the latest 2.1 release now let's you manually type in 8, 12 or 13 digit barcodes from the Scanner screen! If you scan an item that isn't in the 'live' database you get a 'pending notice' displayed in Fresh - Shopping Organizer; this means that the item may be waiting in our 'review' database to have details added like storage location or expiry date for example; often these will appear on your device within a few minutes, but depending on your time zone it may take several hours to appear; if you are in the middle of creating a shopping list that might be a problem, so now in the latest version you can add the product description and storage location yourself if you can't wait! We have also updated the scanner to take advantage of barcode optimization available on some smartphones, fixed a few bugs that affected some devices and made many minor improvements under the hood. Many more updates are planned for the coming months! Fresh 2.0 is now available on Google Play Store! 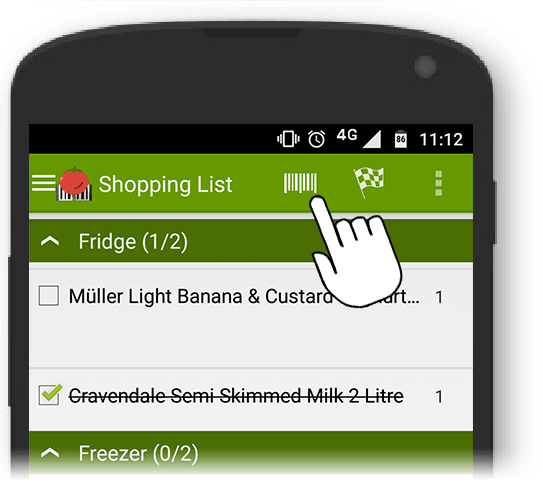 The Fresh - Shopping Organizer app combines Stock Lists for your Fridge, Freezer & Cupboards with a Shopping List. You always know what you have in stock before you shop and you can easily see which items are near their expiry date. Shopping List is split into Fridge, Freezer & Cupboard categories, now you can easily shop for those frozen items last! Items scanned to the Shopping List automatically go to the right category. Notifications when Pending items have been added to the database or items need your attention. Complies with Googles new Android 6 (Marshmallow) Permission rules. If you have Android 6 you'll be asked for permission the first time you use the Camera for scanning and when you first use Google Drive to share and backup your lists. Dozens of minor fixes and enhancements! We've also been busy behind the scenes adding thousands of new products every week to the database, currently over 120,000 items are "Live" and many thousands more are "Pending" (items that are being verified or having their suggested expiry date or recommended storage checked). Many more improvements are planned for the coming months! 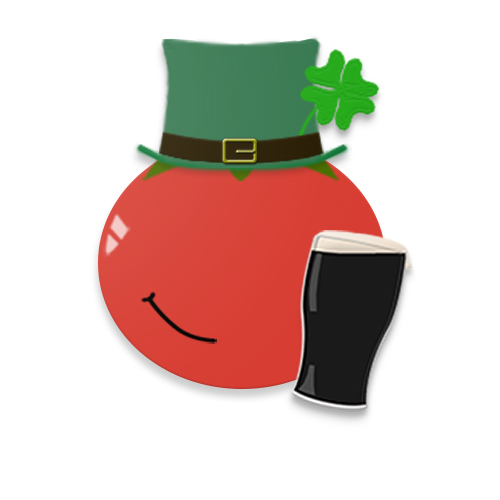 We prefer Guinness Draught to green beer! Need a barcode to scan? Go to our Barcode Lookup page and type in 50213085 (4 cans) if you're in the UK, or 083820123609 (4 cans) if you're in the USA!